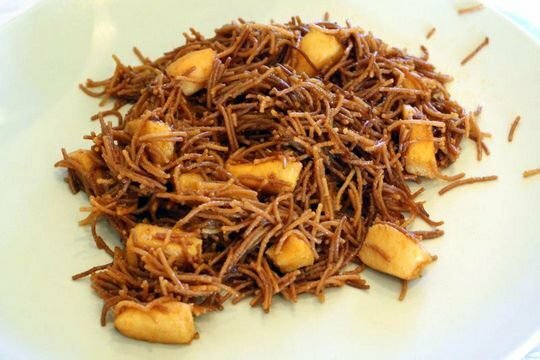 My favorite food experiences from the past year. We are already more than a week into 2013, but it feels like just yesterday I was stuffing grapes in my mouth as the clock struck midnight. After an “early” Spanish New Year’s Eve disco night (we got home at 8:00 a.m. and I’m serious that people make fun of my lack of stamina!) I got sick with a bad cold (wonder why) and am still housebound and barely tasting my food. What better motivation to get well again than to write a post about my favorite food experiences of 2012. I’ve seen other bloggers do this– Foodie International listed her top 10 eats of 2012 (and a dish from Madrid’s El Club Allard tops her list! ), and fellow food tour operator and one of my favorite food bloggers Lesley Tellez of The Mijas Chronicles talked about her favorite food moments from 2012, including making homemade tortillas (the Mexican kind!). So now it’s my turn. I didn’t travel far in 2012, but it was one of the most rewarding year’s travel-wise in a long time. 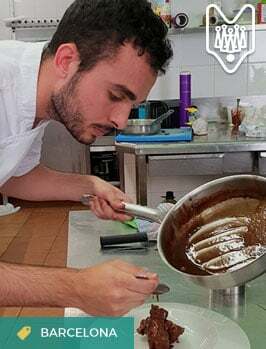 We explored a lot of destinations right here in Spain, and were amazed by the gastronomic diversity you can find among different regions. We also had the chance to visit Portugal and Italy, and were more than impressed by their food scenes as well. Colorful and delicious migas Extremeñas. On our Semana Santa trip to Cáceres, Spain we enjoyed more than the beautiful medieval city. We quickly discovered that their food was local and delicious, and this plates of migas Extremeñas proves that point. 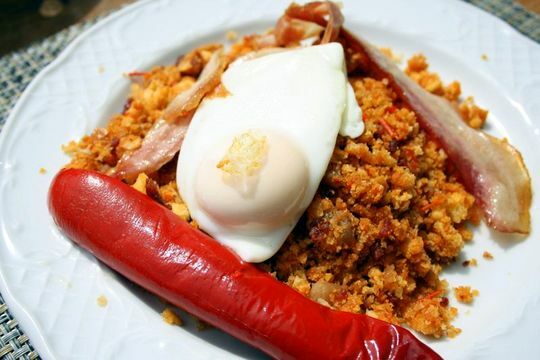 Migas in Extremadura are coarse breadcrumbs fried with pieces of pancetta and chorizo, and then topped with bright red pepper and sometimes a fried egg. This combination is simple but exciting– and something we’d probably never dare attempt at home. 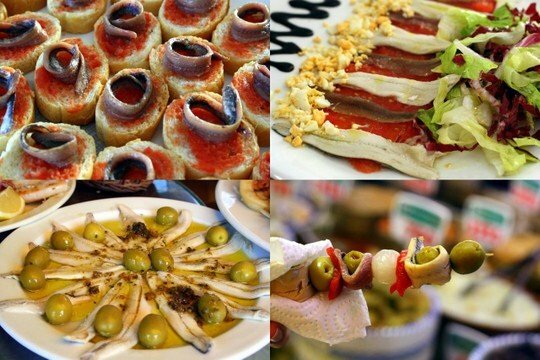 Pintxos or pinchos? 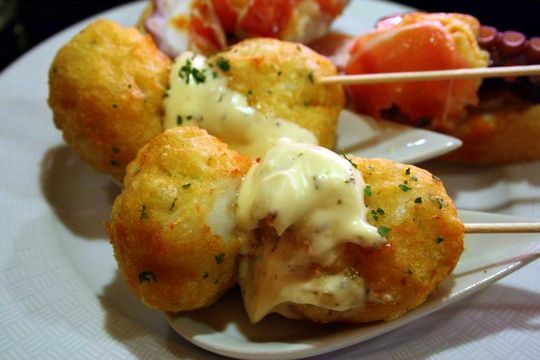 Who cares– they’re delicious in Bilbao! Pintxos (in Basque) or pinchos (in Spanish) are basically the same concept as tapas— small portions of food designed for an individual. The only difference is that they are usually served skewed by a toothpick, which is where they take their name (pintxo means skewer in Basque). They are common across from Basque Country in Northern Spain, where the city of San Sebastián has truly put them on the map. We haven’t visited San Sebastián yet, but Bilbao certainly impressed us with its variety of cheap and delicious pintxos. We ate far too many while there, and pictured is one of our favorites, cod fritters with homemade alioli sauce. This really can’t be defined as a moment or a bite, but it is worth listing. Anchovies in Spain have changed my life. Before moving here I didn’t pay attention to anchovies. Working as a waitress I didn’t even bother asking if people wanted them on the Caesar Salad (oops). Now I know better. Somehow over the course of 2012 I fell head over heels for anchovies. I love them as boquerones en vinagre, vinegar cured and topped with spicy garlic, and also the incredible selection of salt cured anchovies from different regions in Spain. 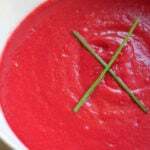 Perfect with olives, roasted peppers, and on toast, I never turn down an anchovy! Watermelon granita with basil jelly and strawberries. Let’s start by saying that I love good desserts. And as good as a watermelon granita (shaved ice) might sound, I rarely skip a piece of cake or a tart to try it. But I was in Seville with Shawn, and she guaranteed that it would be good. It was more than good let me tell you, it was incredible, and quickly elevated La Brunilda to one of my favorite tapas bars in Seville. So what was it exactly? 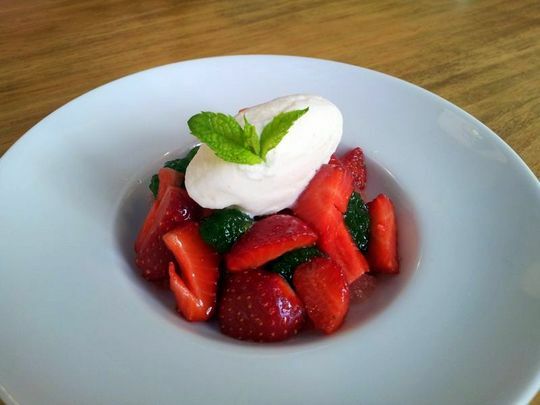 A cold watermelon granita topped with basil jelly, marinated strawberries, and homemade yogurt ice cream. You just have to try it to understand! When I moved to Spain, I never had the opportunity to live with Spanish roommates. It wasn’t an intentional decision, it just never happened. But my friend Sarah did have the chance to share her apartment with two Spanish girls and she had a fantastic experience. Over the summer I was invited to go down to Seville with Sarah and stay with her old roommates. 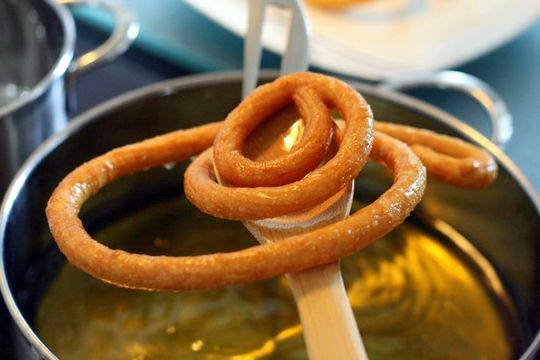 We had a wonderful girls weekend and on the last morning her roommate Sensi showed us how to make homemade churros. They were delicious, better than almost all I’ve ever had out, and so easy to make. 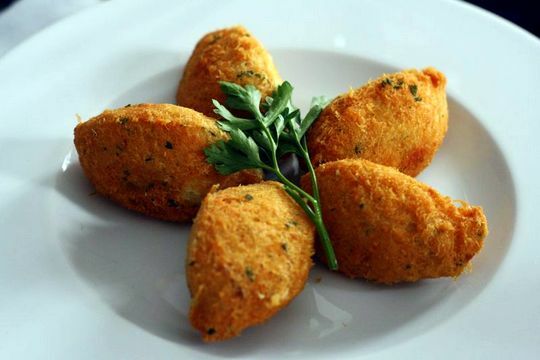 Delicious cod croquettes were always on the table in Portugal. Cod is everywhere in Portugal and it would be easy to get tired of it quickly. Luckily, that didn’t happen to me and I only came to love it more on last year’s trip to Porto and the Douro Valley. The best dishes I tried with cod were barely photo worthy– so I didn’t end up snapping any pictures. But there were incredible cod lasagnas, cod and mashed potatoes covered in melted cheese, and fresh garbanzo bean salads with thin strips of salted cod on top. Pictured are salted cod croquettes, an absolutely delicious snack found at nearly every traditional Portuguese restaurant we visited. 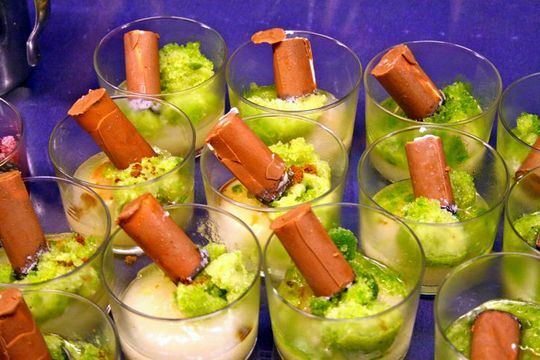 Jordi Roca’s famous Cuban cigar dessert. This is one of the only pictures I have of the food at the TBEX castle party, an extravagant opening night reception for us travel bloggers in the Costa Brava. The caterers were none other than the Roca brothers of El Celler de Can Roca, the second best restaurant in the world! Pictured is one of Jordi Roca’s famous desserts, a mix of mojito and Cuban cigar, but not pictured is the really memorable stuff: the best seared shrimp of my life, smoked raw tuna, hand carved jamón ibérico de bellota, a cheese room to envy any, crisp Catalan cava, and so much more. It is a fantastic food memory that I won’t soon forget! I’d heard about fideuá, seen pictures of fideuá, but was saving trying it until the time was right. Luckily I had that chance at La Vinyeta Winery in lovely Costa Brava. Homemade by the winemaker’s mother, this was what I’d been waiting for. Topped with homemade alioli and a glass of La Vinyeta’s great wine, it was a one of the best meals of 2012. Homemade pasta with 25 year aged balsamic vinegar. 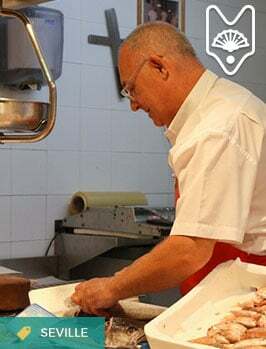 Our pasta class in Bologna was fantastic. Ale did most of the work while I took pictures and relaxed. 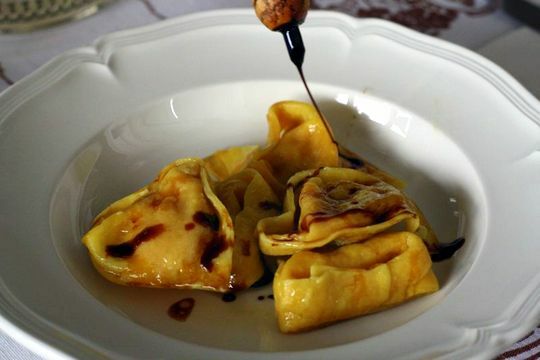 The end result were these giant tortelloni stuffed with roasted pumpkin and parmesan cheese. The sauce was simple, butter and sage, and a drizzle of aged balsamic. It was a meal to remember, and, as easy as it seemed at the time, one we likely won’t be attempting at home any time soon! 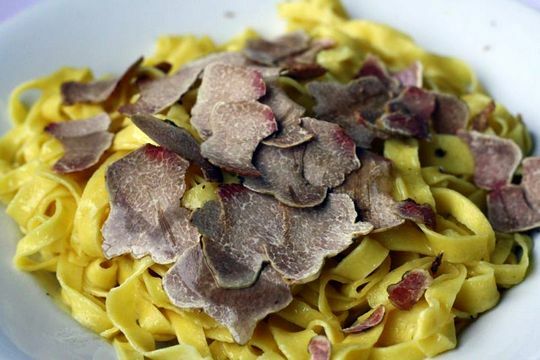 Homemade tagliatelle with white truffles. We were on a food tour of the Emilia Romagna countryside and stopped for lunch at a local tavern. There was nothing fancy about the place (the decor was football memorabilia) but the food was homemade and delicious. I knew we would have to splurge on truffles, it was truffle season after all, and despite a bad truffle year, they had the exceptional white truffle in the kitchen. We were warned that adding it to the homemade pasta would run between 10€ and 30€ euro extra, but we didn’t mind– it was what we’d come for! In the end this dish was right around 10€, probably the cheapest white truffle dish you’ll ever see. They were fantastic, earthy but delicate, full of aroma. 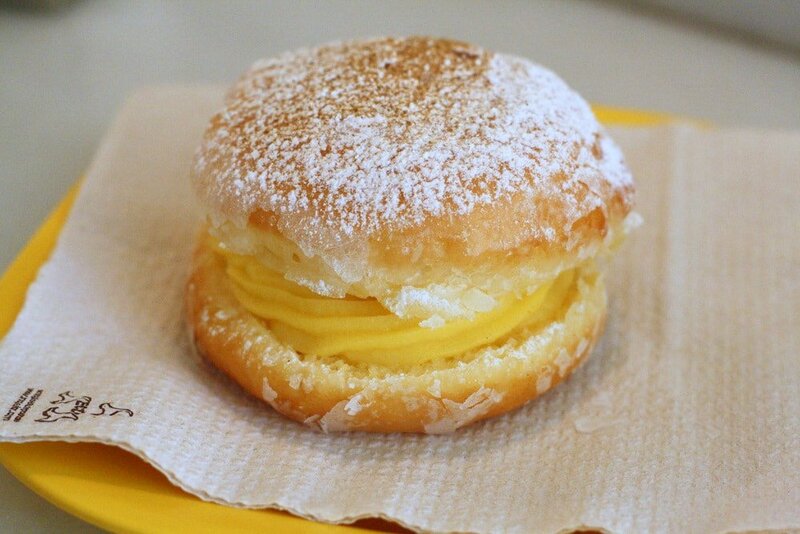 I can’t wait to be back in Emilia Romagna. 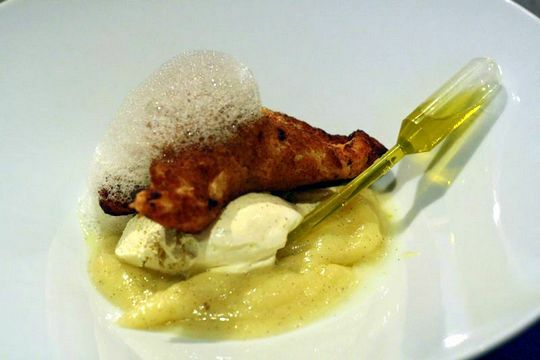 A vanilla bean custard, vanilla ice cream, fried dough and a tube of Picual olive oil. Another unexpected dessert favorite was this concoction from Los Sentidos Restaurant in Linares, Jaen. A creamy vanilla bean custard, cold vanilla ice cream, a fluffy piece of fried dough and a tube of Picual to use as you like– it was strange, but one of the most delicious desserts I tried all year. The extra virgin olive oil was even infused with vanilla beans, making the vanilla sensation even more incredible. I want to go back to this restaurant just for this dessert– it’s that good. Castillo de Canena extra virgin arbequina. When they pulled out what we’d be tasting there was a gasp in the room. 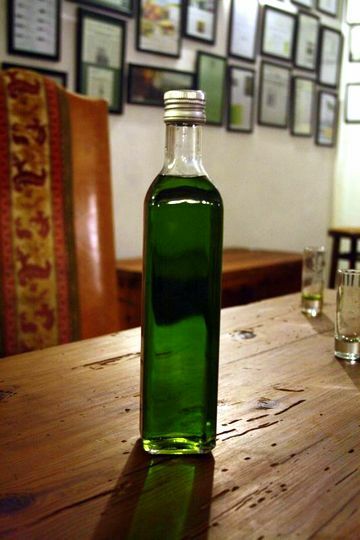 How was it possible to have such a bright green olive oil? Most of us had never seen it before and were dying to taste it. Little did we know, each of us would receive a bottle to take home too. Castillo de Canena is one of the world’s best producers of extra virgin olive oil and this newly processed arbequina (it was only 48 hours old when we tried it) was incredible. It (and the other fantastic oils we tried in Jaén) has completely changed my purchasing habits and I make an effort to spend a little extra on a quality product. And there you have it. Another year has come and gone. I loved everything we tried in 2012, but am betting 2013 will be even better. 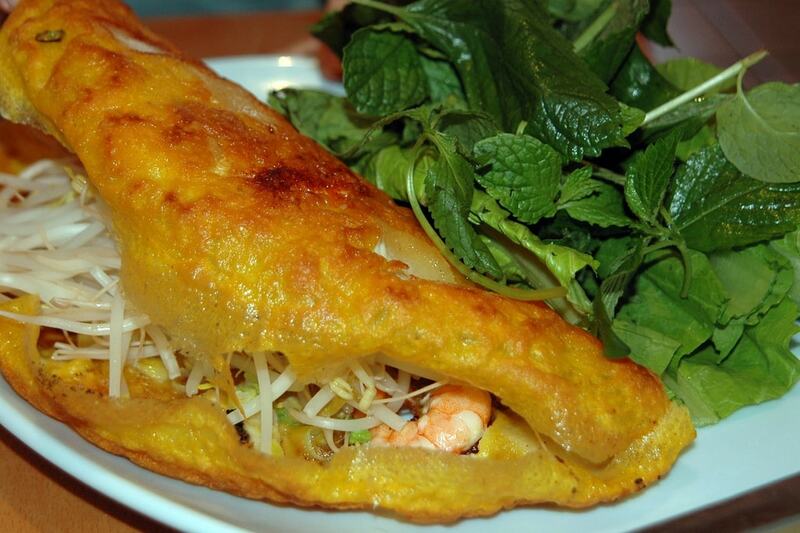 My goal is to travel to some new destinations and eat some completely new foods that I’ve never even heard of before! Which picture is your favorite? Did you try anything new or noteworthy in 2012? I recently returned from Istanbul and noticed in some places green olive oil and thought of your post (rather than freak out!). oh my, such lovely food. I’ll have one of each please 😉 hubby absolutely loved the anchoa too. 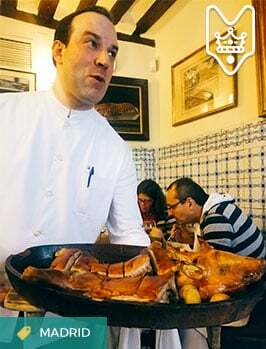 He had countless plates of anchoa y aceitunas, it’s practically all he ate when we were in Spain! and I didn’t know what pintxos meant so I learned something new today. Great post, full of great photos of food! Wow! You’re not doing too poorly. I would love to try some of that olive oil (along with everything else you mentioned, honestly). 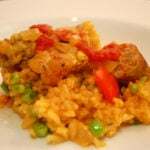 I’ve got a trip to Extremadura coming up and you betcha I have migas on the list of things to eat!